Mom Knows Best : Bonefish Grill Is Opening In Albuquerque, New Mexico On July 28th! 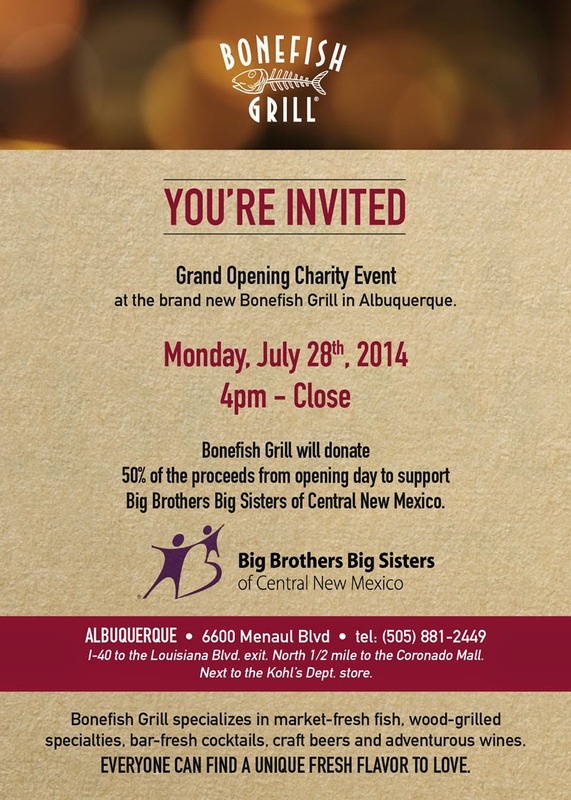 Bonefish Grill Is Opening In Albuquerque, New Mexico On July 28th! I am so excited that Bonefish Grill has come to Albuquerque, New Mexico. We now have a place to enjoy market-fresh fish. They also serve steaks and chicken for non-seafood lovers. Bonefish Grill will be opening July 28th for dinner at 4 PM. The cool part is that night they will donate 50% of their proceeds to Big Brothers and Sisters Of Central New Mexico. So come out for great food and support a great cause at the same time. This looks awesome! :) It reminds me that I need to check out our fish market here in San Antonio. Now that I'm not in Seattle, I forgot about buying fish outside the grocery store. I wish I was in New Mexico so I could attend this event!